Baron Fig Squire - Blackout Edition Giveaway! WINNERS! And the winners are… Matt and Jacob! Connect with me through the Contact page this week to claim your prizes! Special Coupon for Baron Fig: If you weren’t one of the winners but have been looking at getting something from Baron Fig, you can save $10 off with a coupon from my referral link. This isn't a sponsorship link, but can help me to purchase more goods for review (and do more giveaways!) from the folks at Baron Fig. There is a fountain pen brand that seems to be taking US retailers by storm this past year called Opus 88. Now, they’ve been around for awhile, but have just been hitting the US stores in 2017 and 2018. One thing of note is just how photogenic these pens are. Their models are generally brighter, glossy colors, and the designs are just really pleasing to the eye. Some pens are just “meh”, or look like every other fountain pen, but for some reason (to me) the Opus 88’s don’t. Pen Chalet was kind enough to send me over one of the “Picnic” models, which is an eye dropper only series pen…scared yet?… It isn’t so bad. Out of the Picnic series of four colors I picked what is probably the most boring one, brown, but it appealed to me. What can I say? And, I bet most people wouldn’t pick it so I wanted to see how well the color matched up to the picture. In real life it is so much better and actually has a sort of vintage vibe. The pen comes in simple but tasteful packaging, a black faux-leather hard cardboard box in a grey paper sleeve. The box has white lettering and in a corner says “Since 1977”. The packaging kind of reminds me of what you might see in the 70s, but I digress. It really is ok, but won’t win any presentation beauty contests. Upon opening the box you’ll find the pen nestled in a foam cutout and alongside it is a glass pipette for filling. I have to admit, this is the first time I’ve received an eye dropper only pen so it was interesting to see. When I say eye dropper only, this is actually true. 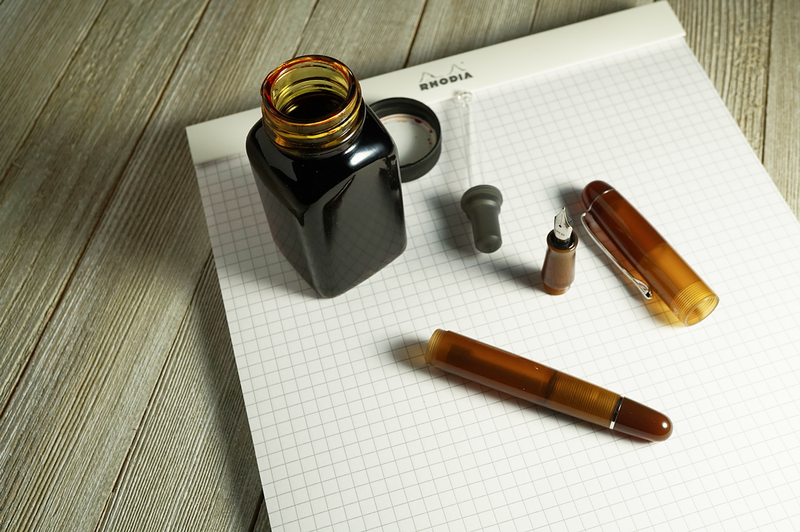 With some acrylic pens you can use a cartridge or converter, but also choose to seal up the treads really well and fill up the barrel with ink. Before trying this with just any pen, see if it is possible first or if anyone else has tried it…. What makes the Picnic different is that inside the barrel there is a sort of agitator that can be moved up and down slightly by unscrewing the end cap. This relieves air pressure (or adds it?) within the feed allowing the ink to flow. I’m not entirely sure of the science which also made using the pen initially somewhat unnerving. All in all, I probably was overthinking it and it was fine. 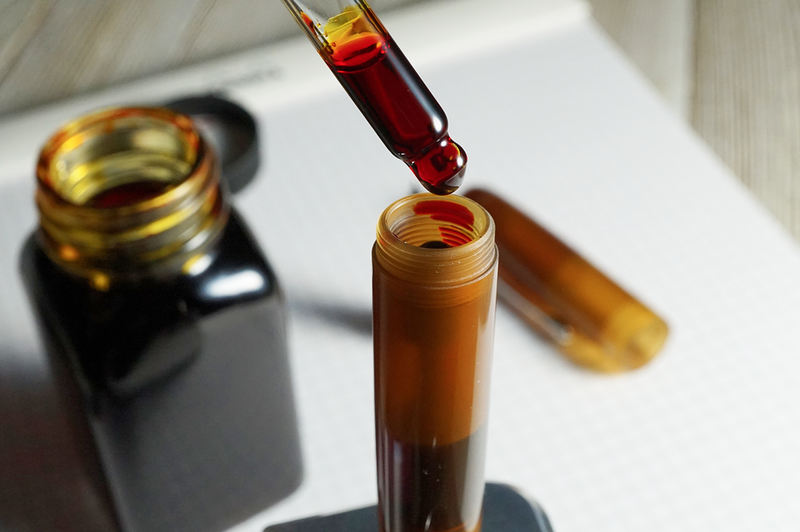 To fill the pen you unscrew the section and nib and use the pipette to transfer ink from a bottle to the barrel. The pipette worked pretty well, but was hard to get a good fill on so I had to transfer ink a few times to get to the level I wanted. I decided to fill the pen up with Noodler’s Apache Sunset, a beautiful orange-ish ink that has awesome shading properties. It’s like you’re writing with hues of different orange/yellow colors from the same pen. While it was a touch too orange to be a perfect pairing, I feel it went with the brown well. One thing I really like about the barrel being translucent is how the same material can provide different shades depending on thickness or overlapping. The machined parts on the inside take on more of a tan color while the see-through parts maintain more of a caramel. The solid ends are the darkest letting the least light through, but I love how much contrast you get. Once filled I replaced the section and nib, then cracked the end cap as instructed to get things going. Again, I wasn’t sure how much to open it, so I gave it just a couple turns. It took the ink a little bit to fill the feed, but once it was there it flowed well. The pen comes with a stainless steel #5 nib made by JoWo which is a trusted brand. For the size of the pen I found the nib to be a little small and would probably have preferred one step up to balance it out. The writing experience of the nib I would describe as glassy, gliding across the page without much feedback. I did notice some pretty consistent slow starts on the first vertical stroke, enough so to test it in increments for the review. After that first stroke, the nib felt great and is enjoyable to write with. While writing I have not posted the pen, partly due to the complex I seem to have with the shut-off valve, but it is possible to. I feel the pen is big enough to be very comfortable unposted. For $99 I think you get a really quality pen that is beautiful, and even a bit on the “fun” side. I’ve enjoyed using it quite a lot. Now, is the eye dropper experience one that I enjoy going through? It is really easy to use, but for me personally I would probably choose a piston or converter style out of convenience. Cleaning requires flushing the pipette, barrel, and section/feed while other pens are a little easier to do in one swoop. Thanks again to Pen Chalet for kindly sending the Picnic over. Which color would you choose? Baron Fig Squire - Blackout Edition Giveaway! It’s been a little while since I’ve done a giveaway at The Clicky Post, so we’re going to be doing two pens this time… Happy New Year! 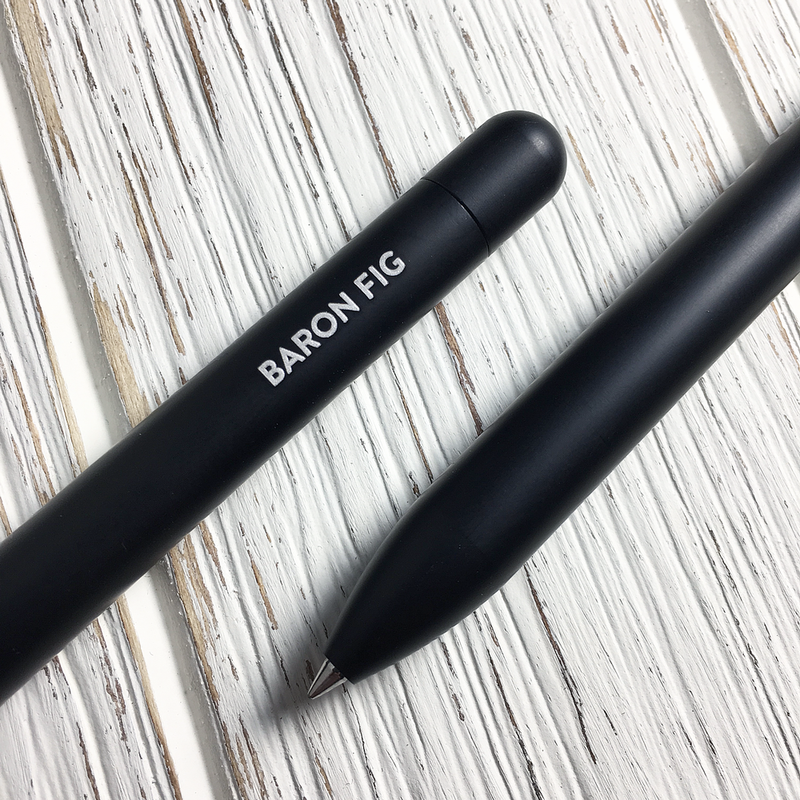 Up for grabs are two of the recent Blackout edition of the popular Baron Fig Squire rollerball pen for two winners! The Squire has become one of my go-tos over the last couple of years and definitely wanted to share it. - To enter, leave a comment below (limited to one entry per person; no cheating! ): What is a pen you can’t seem to leave the house without? - I will arrange the entries in numerical order and randomly select a winner. The winners will be announced on the blog on Saturday, January 5th and will need to connect with me within a week to claim their prize. And… Special Coupon: If you’ve been looking into getting something from Baron Fig, you can save $10 off with a coupon from my referral link. This isn't a sponsorship link, but can help me to purchase more goods for review or to be given away from the folks at Baron Fig.